Adam revisits one of the Lumanries of the Rom- Com genre and of the 1990’s; Four Weddings and a Funeral. Now, being released with a new 4K transfer and Extras from Shout Factory’s Shout Select label. Some films age gracefully. It appears that Four Weddings and a Funeral is one of those very films. The Mike Newell film showcase for star-in-the- making Hugh Grant and a who’s who of British acting. 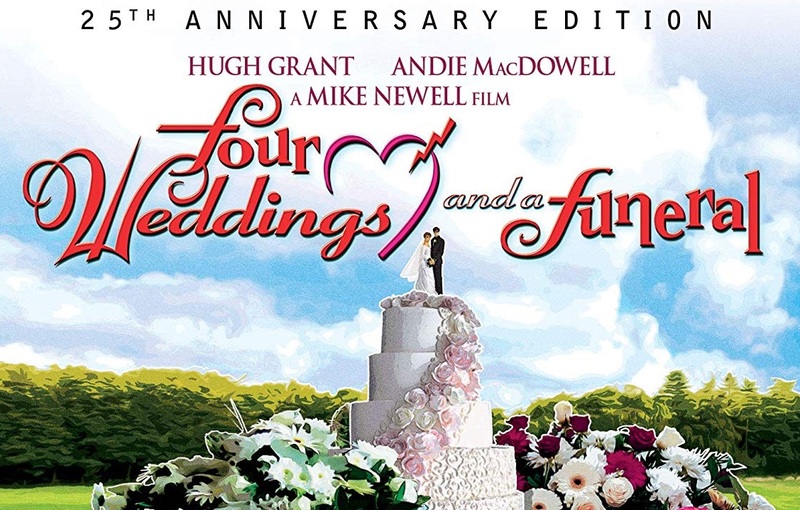 The film cleverly structures it’s romance between Charlie (Hugh Grant) and Carrie (Andie McDowell) between as title suggests four weddings and one funeral. We watch Charlie and his band of misfit friends (that include Kristen Scott-Thomas, Simon Callow, John Hannah, and Charlotte Coleman) as they navigate the trials and tribulations that weddings (and a funeral) bring up in a group of late star-in-the-making to early 30’s friends. Much of the film shows, and quite adroitly, that ball of emotions that comes with these ceremonies. One of the minor issues is some of the chemistry between Charlie & Carrie. Much of it is some of the flat line readings by Andie McDowell. Though she does carry most of the film fine, there are moments that it does not work. Grant as Charlie is perfectly cast but his work with McDowell isn’t as good as it is with the rest of the cast. It also helps that the rest of the cast IS aces. Which helps eases the rougher moments of the major romance. As time has gone on much of the success of the film has been discovered to be screenwriter Richard Curtis’ deft, witty and emotionally satisfying script. Curtis understands better than anyone currently, and at the time, the romantic comedy as a genre. Four Weddings and a Funeral is the blueprint for most of the successful Rom-Coms of the era. Here it feels organic and genuine and personal. The new 4K Scan From The Original Camera Negative is beautiful but many will want to criticize it but shouldn’t. Many will take umbrage with the healthy amount of grain present in this transfer. Though in this viewers estimation the grain is what makes this iteration feel like the closest of the theatrical experience (yes, I did see it in its original theatrical release). Many will find the darker more saturated look unappealing if inaccurate. They would be wrong. This transfer is as gorgeous representation of Four Weddings and a Funeral as possibly released in any format thus far. The commentary by Newell, Kenworthy, and Curtis recorded in 2004 is a great group commentary. A combination of production anecdotes, asides, and themes of the film are discussed. If an audience has not listened to this one, it’s a definite listen. Wedding Photographer Michael Coulter is a newly recorded 26-minute interview with the director of photography. Coulter discusses his theories on making the film and also what he actually does day-by-day and shot-by-shot. Coulter is great at breaking down what a focus puller does, what a camera operator does. He also discusses his career beginning and how he met Bill Forsyth and their collaboration (Greggory’s Girl & Being Human – he photographed but had done various crew jobs on other films). He discusses his work with director Mike Newell (director of Four Weddings & a Funeral). He also goes through location by location and how they shot it. It’s a real thorough interview. The Wedding Planners is an archival 29-minute making-of featurette starring Richard Curtis, Mike Newell, Duncan Kenworthy, Hugh Grant, Andie McDowell, and Simon Callow. The making-of briskly tells the story of how they created this, now legendary, Rom-Com. The documentary does a solid job of recounting the film’s low-budget production and sleeper hit release. Four Wedding and a Funeral …In the making is a 7-minute archival EPK done at the time of the release. This making-of is very “of the era” and hilariously self-congratulatory. Many will find it fascinating entertainment that includes pre-famous Hugh Grant waxing about sending Newell the video of his brother’s wedding where Grant was best man (and had a similarly charming speech) and Andie McDowell getting married to Jimi Hendrix being played. Well worth the seven minutes for those into nastalgoa blasts. Two Actors and a Director is a 5-minute archival interview with Newell, Grant, and McDowell discussing how the two actors got their respective parts. Delete scenes amount to 10-minutes that are introduced by Kenworthy. The scenes are not vital but there is a 3-scenes moment starring Rowan Atkinson that are actually hilarious, and other odds and ends. Rounding out the special features include Spots, Trailer, and Promotional Spots. The Promotional Spots should not be missed. They are introduced by Kenworthy as he explains that Richard Curtis actually “wrote” them which are “behind-the-scenes” trailer. Four Weddings and a Funeral is still first-rate entertainment. The classic Rom-Com gets the deluxe 5-Star treatment by Shout Select with an amazing transfer and a bouquet of extras.